The Audi S5 Sportback is fitted with a 354 hp, 369 lb-ft turbocharged 3.0-liter V6 and an 8-speed automatic transmission that powers all four wheels. This combination provides effortless speed under almost any road conditions, available sport adaptive dampers and sport rear differential further increase its handling abilities. Luxury and safety levels are superb with available active lane assist, Nappa leather and virtual cockpit some of the more notable options. Cars are a dying breed you say? Maybe for the masses and the forgotten family sedan, but the luxury segment is booming with new crossover cars that blend the practicality of stigmatized wagons, the styling of a coupe and the profit margins of sports cars. Okay, the four-door coupe segment is still a niche player, but it represents an area of growth and interest in a moribund part of the market. What Mercedes-Benz started with the in 2005 has spread to all of the German brands' sedans in multiple segments, BMW with the 6 and 4 Series’ , with the and then A5 Sportback, Volkswagen with the Passat CC, and now even cars as common as the Kia Stinger and borrow that heavily raked C-pillar that defines the breed. I can’t say that most of them appeal to my tastes aesthetically, but in the absence of an A4 or in North America, the 2018 S5 Sportback would easily be my choice in the entire range and fits the sporty family vehicle formula to a tee. The S4 is that natural athlete in the lineup, and the S5 simply adds a backpack. Okay, will say there’s a bit more to it than that, but that’s good enough for me. 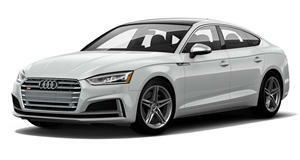 The S5 Sportback features a 3.0-liter V6 with TFSI direct injection and twin-scroll turbocharging for 354 hp and 369 lb-ft of torque, and has kept weight under 4,000 pounds at 3,924, so it’s a fair amount of poke for a car that isn’t terribly overweight (if you’re curious, check out the weight of the previous generation S5 convertible). Horsepower peaks between 5,400 and 6,400 rpm, but torque is available pretty much immediately, from 1,370 to 4,500 rpm, so from the moment you get on the gas pedal until you inevitably back off or call up the next gear, it keeps pulling hard. made a big change in the transmission for this generation, making its eight-speed automatic standard in place of the seven-speed dual clutch and dumping the manual transmission. I loved that manual, and I loved the V8 from the early years of the S5, but progress is a necessity, as is a business case, so the preference of people actually buying these cars is understandable. With all that legacy going against it, the eight-speed Tiptronic does not disappoint. It feels just as fast to swap ratios as the dual-clutch S tronic, the Sport mode is suitably aggressive without being frantically annoying, and it solves the low-speed jerkiness the dual-clutch displayed. Quattro all-wheel drive does its part, in normal conditions splitting power 40:60 front/rear, but can redirect up to 70% to the front or 85% to the rear, and a self-locking center differential and stability control braking intervention combine for multi-faceted wheel-selective torque control. For the most part, you simply always have grip and acceleration, but a significant leap over previous generations is its greater poise on turn in, and better manipulation of the all-wheel drive and traction control to minimize understeer. Frankly, it’s brilliant, and although I’m sure track testing or a big snowy parking lot would reveal where exactly understeer would rear its ugly head, such an occasion did not present itself. It was simply grip and rip all week long out of any corner I tossed it into. All of these powertrain tweaks also contribute to a very respectable sprint to 60 mph in 4.5 seconds. It’s not neck-snapping acceleration, but it’s more than adequate for this gentleman athlete type of car, and it’s all very satisfying as a total package. Steering feedback is muted, but it varies from easy in Comfort mode to quicker and heavier in Dynamic mode, and it’s paired with impeccable precision. Every action on the steering wheel in Dynamic seems to elicit the expected degree of turn-in, and the well-damped suspension (which can also be varied between Comfort and Dynamic) keeps the wheels in with the road without too punishing a ride. Starting from the back, the trunk was a joy for me, as it was wide and deep, with all the functional space you’d find in most crossovers - how often does anyone pack their SUVs over the window line anyway? With the seats up it measures 21.8 cubic feet, and the rear seats split 40/20/40, that middle section as good as a ski pass-through for winter-sports families, or a maximum of 35 cu-ft. The coup de grace is the tall opening thanks to the hatchback style, although there is a high lip that heavy cargo would have to be lifted over. Front passengers are treated better because there are only two seats, and they are suitably adjustable for all sizes and shapes, right down to the pneumatic side bolsters and massage function for driver and passenger. Although there is no breezy ventilation to cool your backside (or heated steering wheel for that matter), the seats are a gorgeous leather, an eye-catching red in our tester (the nappa leather a $1,250 option), and quilted for that added touch of luxury that go along with that sleek, distinctive profile that help make this car feel ‘special.’ That’s a rare feat in cars that cost less than a hundred grand, and the S5 starts at $54,400 ( $975 freight & PDI on any model), while the less sport-oriented A5 starts at $42,600, although this tester packed on all the dynamic options and landed at a slightly harder to swallow $67,375. At that price, however, the S5 isn’t just a luxury car and a sports car, it’s also a technological tour de force. Virtual Cockpit turns the gauge cluster into a 12.4-inch screen that can morph to suit your driving tastes or mood, and it's joined by ’s intuitive MMI in the center console, with standard Apple CarPlay and Android Auto, not to mention available 4G LTE hotspot and satellite radio. The MMI system is controlled by a scroll wheel and menu buttons, but you can input via the handwriting recognition touchpad. Adaptive cruise control also features traffic jam assist and lane keep assist, which keep you cruising at the pace of traffic, right down to stop-and-go traffic while steering you back into your lane if your attention wanders momentarily. Navigating parking lots is helped by an overseas view parking display with front and rear distance sensors, rear cross traffic alert for exiting parking spots and even a warning to not open your door if the blind spot monitor detects approaching car or bike or pedestrian if you’re parallel parked. And to top it all off, the Bang & Olufsen sound system is excellent. It’s like a Renaissance Man of cars. 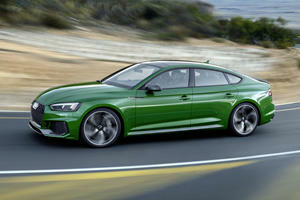 To go back to my selection of the S5 Sportback as THE to have, I’ll lay out my though process. The and S7 and Q7 are too large and pricey, as is anything above them in the range. I am a huge fan of the A3 (especially in RS3 guise—love that one-of-a-kind turbo-five), but it is small, and a family of four can fit, but the daily tasks become a bit more of a struggle, from buckling the kids up in a car seat to packing the trunk on a long road trip, and the slightly more practical wagon is only available as the less sporting hybrid. The A4 Allroad is too much to the practical end of the spectrum, as is the Q5, but the SQ5 might certainly be in the running seeing as it’s priced almost identically to the S5 Sportback and has most of the same qualities, with only slightly diminished dynamics. The A4 and S4 sedans are superb depending on your power needs, but it’s still a sedan with a confined trunk, so it’s a no brainer in my mind to choose the greater cargo space and convenience of the A5 or S5. The A5 Sportback certainly has the convenience, and the power is reasonable, but skip some of the luxury options and you can get the S5 with S sport package for less than $60K, with many of the basic goodies like sport seats and appearance package baked right in. Although the 2018 S5 Sportback isn’t alone in this segment, facing mainly the 4 Series Gran Coupe, it stands out in a crowd, as proven by numerous thumbs ups from other drivers and people asking questions in parking lots. It doesn’t quite check all the boxes for us wagon-lovers, but it does meet the needs of a fast family and proves itself a stellar performance vehicle for everyday use.